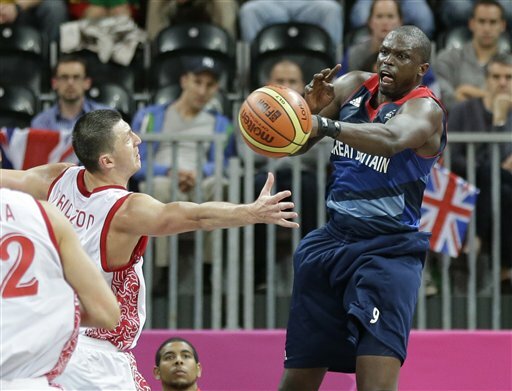 Luol Deng playing for Great Britain against Russia in the 2012 Summer Olympics. 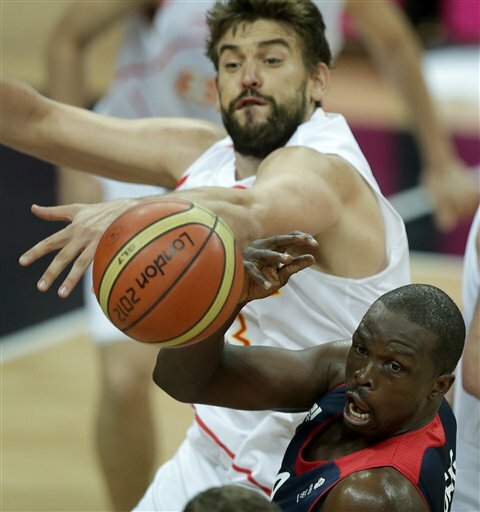 Luol Deng faces NBA player Marc Gasol in the England-Spain Olympic game. There&apos;s one athlete competing in the Olympics who embodies more than one Olympic ring: Luol Deng. Three of the five rings representing the participating continents have meaning to Deng. He was born in Sudan, immigrated to London and plays NBA basketball right here in Chicago. Chicago Bulls fans can&apos;t understand why Deng, who has played this season with an injured left wrist, participated in the Olympics on behalf of England. Most people in the sports world have judged Deng harshly on this decision, arguing that he wasted his time playing for a country that had no chance of winning. But the criticism doesn&apos;t faze Deng, who said he appreciates all that has been given to him and his family. Deng’s father was an imprisoned government official in Sudan who was given political asylum in England. Great Britain then embraced his mother, father and eight siblings. Even though basketball is not a household sport in the U.K., this was one way Deng could show the world how grateful he is to his adopted country. Two years ago, Deng took a life-altering trip back to the Sudanese village that he fled more than 20 years ago. During his return to his homeland he met another young man his same age that had also fled. Unlike Deng, the young man lost his family — and has not been re-united. “Here I am in Chicago, in the NBA, and he is by himself and we’re from the same country same village — and his family is lost,” said Deng. That chance meeting and his return to Sudan, according to Deng, was “a wake-up call.” He learned to appreciate everything, he said. Large or small, complex or simple …it all has meaning. Even before his trip, in 2005, Deng set up a charitable foundation to help people in Chicago, the United Kingdom and Sudan. The foundation&apos;s main mission is to help all Africans get the basic necessities of food, water and shelter. Deng considers this work to be one of the most important aspects of his life and he knows his NBA fame allows him the opportunity to support his cause. Deng knew going into the Summer Games that there would likely be no medals involved, what with the limited ability England can provide on the basketball court. Indeed, despite his efforts on the court, Great Britain are 0-4 in pool play and will not advance to the medal round. But Deng was not deterred. He did everything to help this team qualify — and that wasn’t easy. Great Britain gave Luol Deng more than he could ever give back. He&apos;s trying nonetheless. And how could you argue with that?